This year will be my first year making a turkey. I’m a little nervous about it even though the instructions are clearly written on the back of the turkey packaging. I figure it could go one of three ways: I burn the turkey a la The Santa Clause; the turkey is so dry its inedible a la National Lampoon’s Christmas Vacation; or it could turn out perfectly. I’m rolling with option number three, and I’m pretty sure our friends are as well considering they’ll have to eat said turkey tonight. That’s right! I’m making the turkey this year because we’re hosting Friendsgiving! Apparently, it’s a thing. If you host, you make the turkey. I didn’t know that, but there you have it. Thankfully, I planned a Friendsgiving last year (a successful one, I might add, yay!) and one last week with a friend of mine, so this wasn’t a total stretch. Really, I love decorating and cooking for the holidays, so you won’t hear me complaining about hosting. 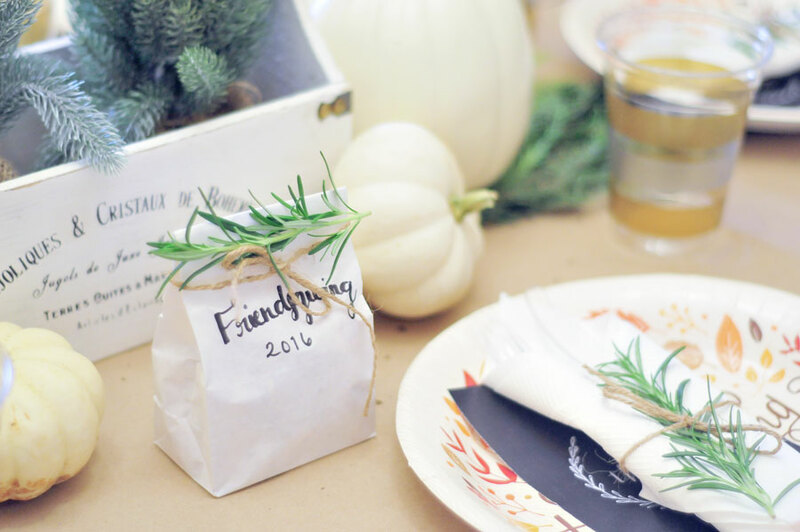 If you’re finding yourself hosting a Friendsgiving or Thanksgiving this year and still don’t feel like you have all the details down, I’ve got you covered! 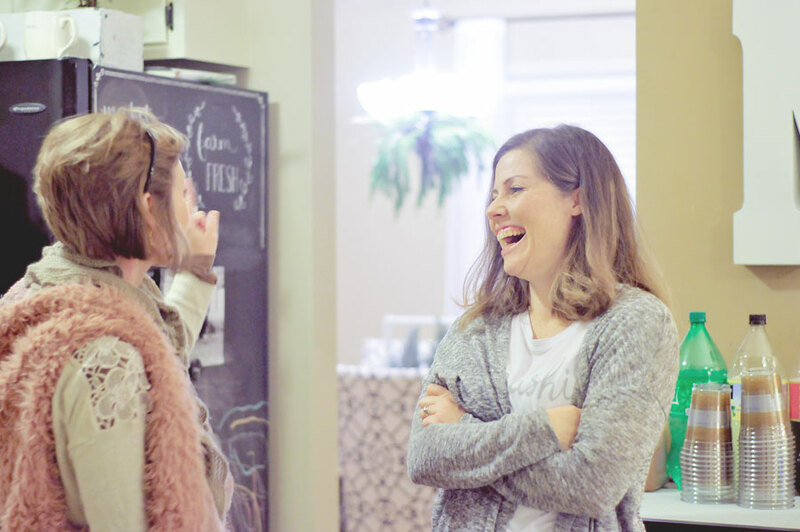 Here are all of my tips on how to host for the holidays! And I’ll be sure to let you know how my turkey turns out. Wish me luck! Pick a date, a menu and a few friends. Invitations are one of my favorite things about a party! You can design your own or browse Etsy for some incredibly beautiful ones to download and print yourself. This year, we went really informal and sent out invites via text because we were a little rushed. Thankfully, it made planning the menu a heck of a lot easier because we were able to decide on potluck items in the same string. I love a good potluck, especially around the holidays because it’s a great way to get new recipes from friends! 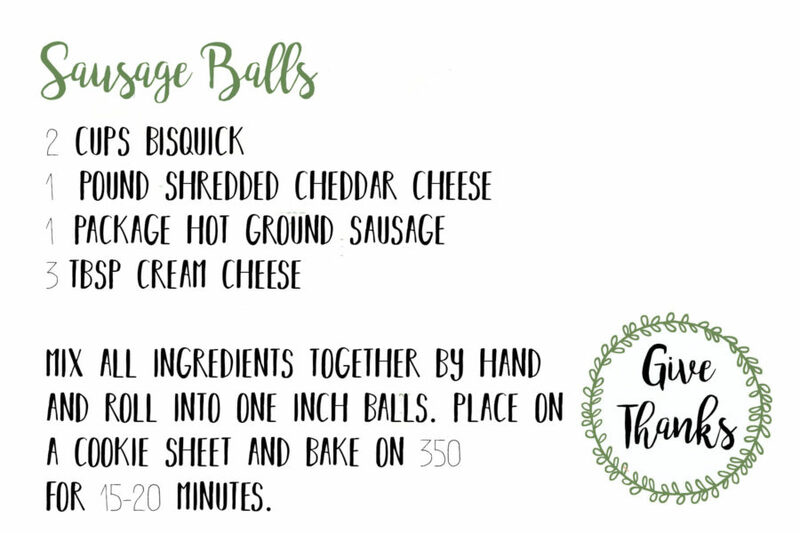 Here’s a printable to make sharing recipes even easier! I always try to make sure the turkey (or ham) and stuffing are covered by the host, and also that I have one or two appetizers and a dessert on hand. That way most of the basics are prepped, and all of your friends get to pick their favorite side to bring! 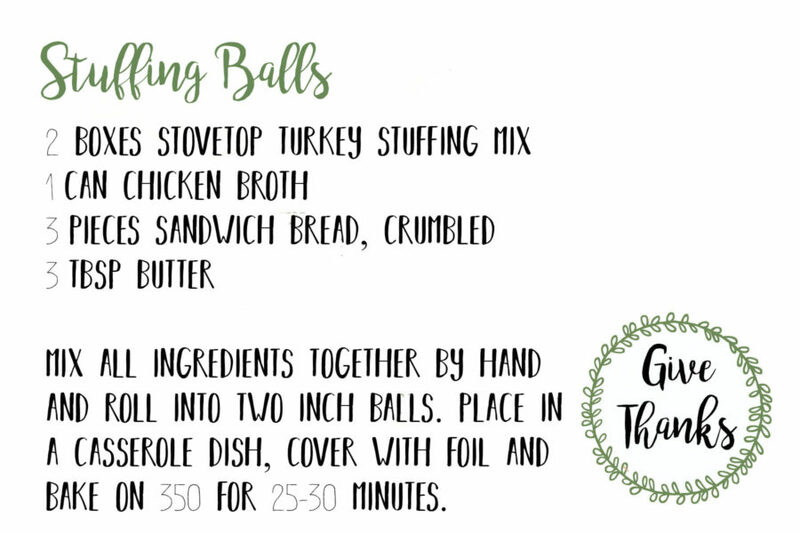 This year, I made my favorite stuffing recipe, this beer bread and garlic garlic dip, sausage balls, pumpkin pie and pecan pie in addition to the turkey. I told you I like to cook for the holidays! Admittedly, aside from planning the menu, this is my favorite part! 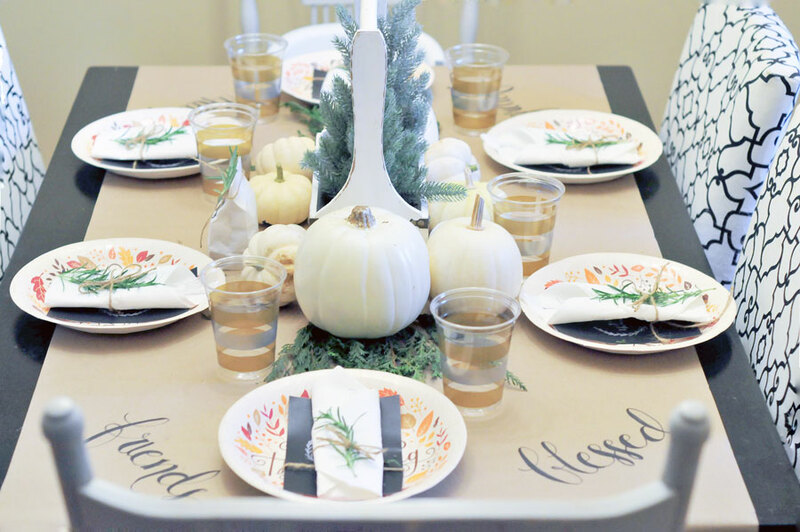 I showed you how to create a fall tablescape a few weeks ago, and Amanda hit the decor portion of Thanksgiving yesterday with tons of inspirational ideas! I pulled from those ideas, and this is what I came up with. My go-to tablecloth is either a burlap sack or brown kraft paper. This year, I went with the kraft paper, and wrote out seasonal words like “friends” and “give thanks”. I hand-lettered each of these using the tips Liz provided in her post on handlettering which you can find here. 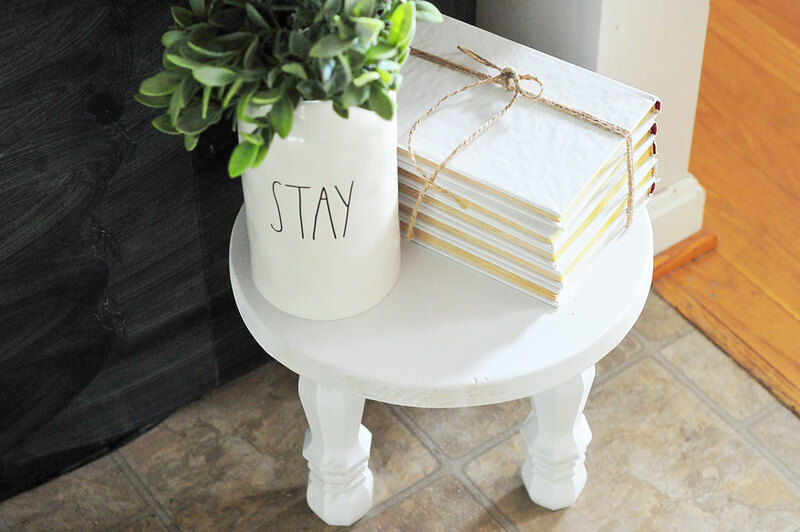 If you’ve read the premiere issue of the Magnolia Journal, you know there are tons of ways to use greenery in your decor. I took a cue right off the cover and hung cedar boughs from our dining room chandelier. I also placed some on the table, along with those white pumpkins I used in my fall tablescape. 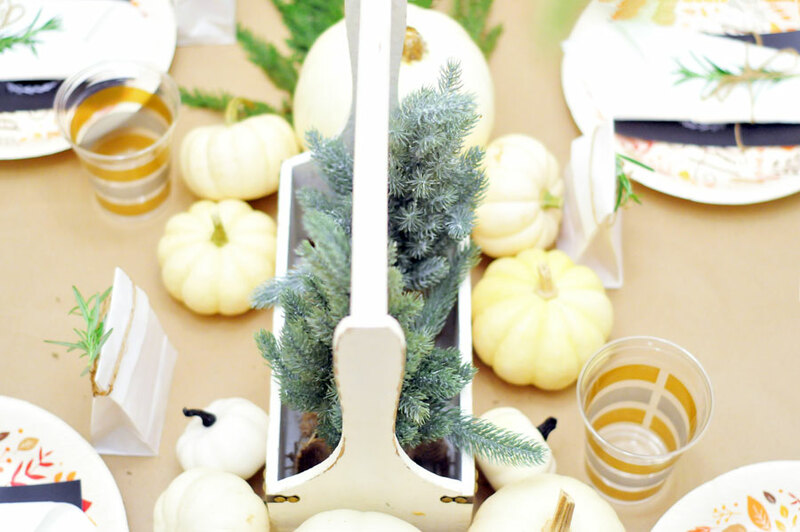 These adorable burlap-wrapped pine trees are from Home Goods and made a perfect addition to the centerpiece. Continuing the greenery theme (thank you, Joanna Gaines) I took clippings of fresh rosemary and tied silverware and napkins up with twine. 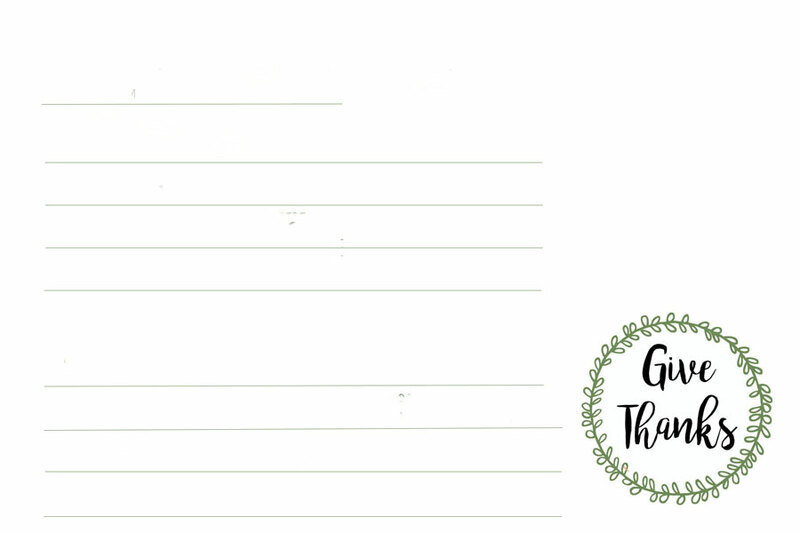 Underneath each, is a chalkboard printable that says simply “give thanks” which you can find here. Hobby Lobby had all fall decor 80% off, so I snagged the dinner and dessert plates there. I also incorporated our fall printables into the decor. 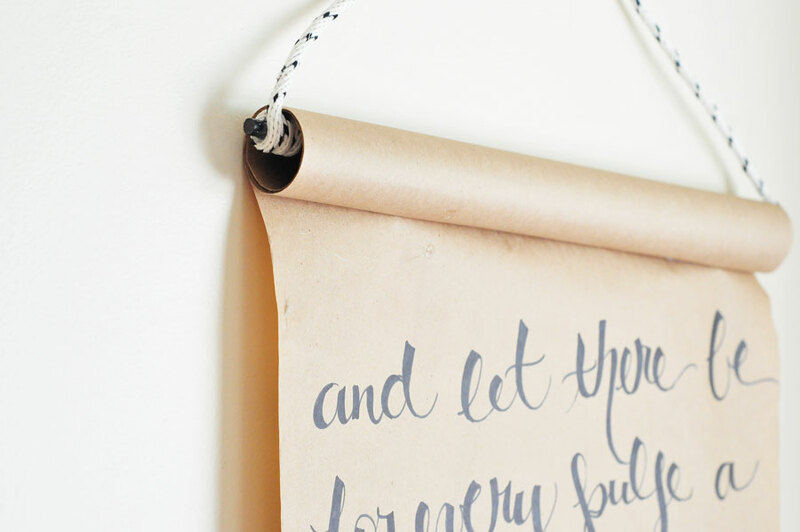 You can enter your email here to download our printables! 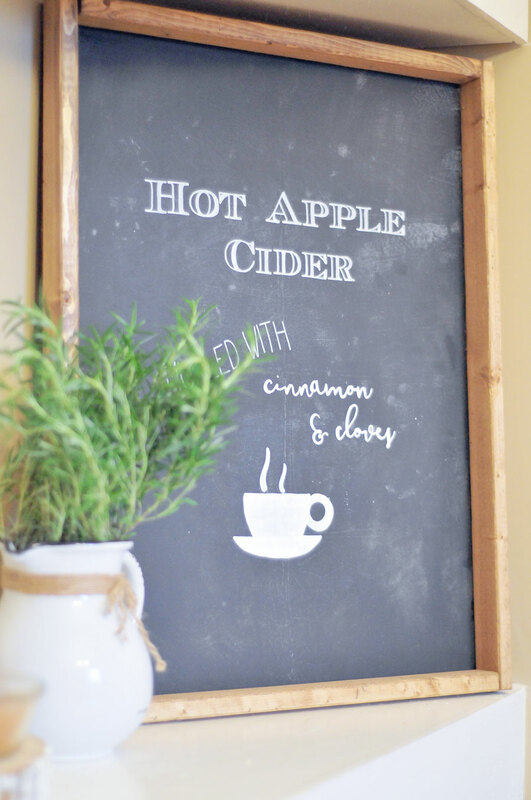 The hot apple cider bar was the perfect addition to our Friendsgiving decor, too! You can read all about the details of that here. Prep Everything the Day Before. I mean everything! We had the turkey thawed and seasoned and even in its roasting pan. Any dips, appetizers, sides or desserts that you can make ahead of time, get those taken care of. 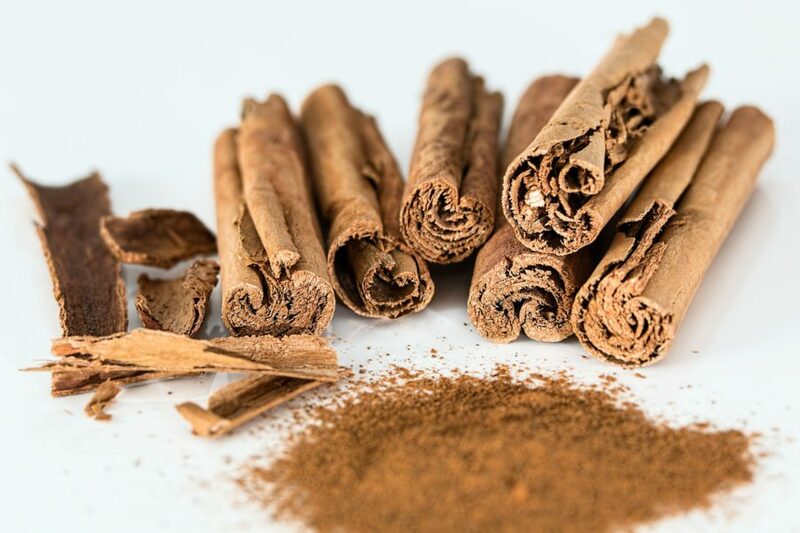 It will save you such a headache the day of (trust me!). There is always something unexpected that happens or an ingredient I realize I don’t have. Anything that needs to bake, you can prepare the day before and pop in the oven the day of your shindig. A little trick I learned when I was first starting is to cover everything in aluminum foil and write on the foil what temperature it needs to be baked at and how much time it will take. It makes me feel super organized which leads to less stress (that’s good for everyone!). One of my favorite ways to go the extra mile during the holidays is by providing takeout boxes for our guests. It also saves me from having to buy all new tupperware because I will inevitably forget who has what. That’s just how I roll. I told you Hobby Lobby had 80% off all of their fall items, and these to go boxes were no exception. Line them with parchment paper or wax paper, and your guests will have to go boxes for all of those leftovers! Another great way to make your guests feel special is party favors. These don’t have to be extravagant, just a little something to say “thanks for coming”. 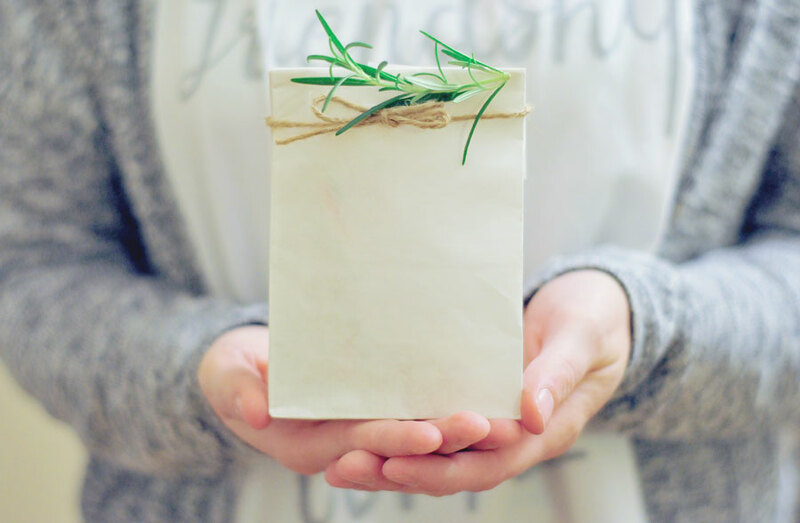 I picked up these white kraft paper bags, filled them with Reese cups and candy canes, taped them closed and tied them with twine and rosemary sprigs. It took less than a minute to make each one, and they didn’t go begging! This is always the hardest part for me because event planning and enjoying myself don’t usually go together, but it’s the most important part! Why go to all the trouble of throwing a beautiful party if you’re not going to love on the people you’re throwing the party for? Once the food is ready, the prayer is said and everyone takes their seat, enjoy spending time with those you love. Laugh a little. Relax, and think about the mess after the last person has gone. If you love games, have some cards or board games on hand. We put kraft paper on the kids table along with some crayons to keep the little ones entertained, and designated a play area for them with books and a movie. If you all love making things, set up some craft stations. If you just love to chat and drink cider, set up a cider bar. The possibilities are endless, and you’ll be free to enjoy all of these things without having to be in “host mode” all night. 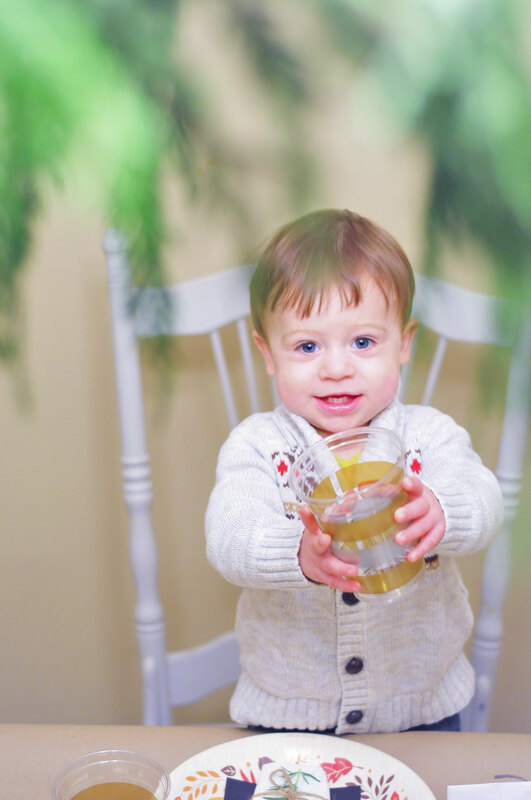 Speaking of kids, this little cutie was helping set the table, and I just couldn’t resist snapping his photo. How cute is he and that little sweater!?! Okay, this part is the worst, but it can be really quick and easy if you’ve prepped right. I use a throwaway roaster pan for the turkey (mostly because I don’t actually have a roasting pan, but also because I can just toss it at the end of the night). All of our dishes were disposable. 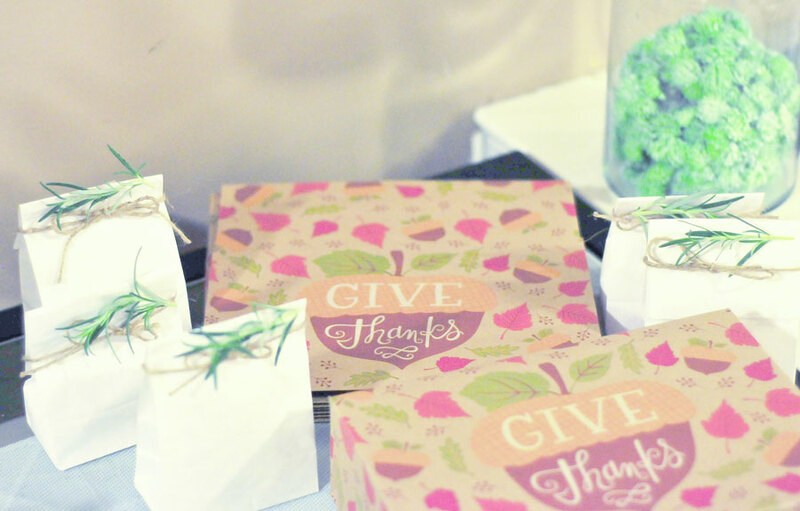 The printables were gifts along with the party favors, so guests will take those with them when they leave. Set all of your tupperware aside during your prep the day before so you can easily store any leftovers that weren’t taken with guests and get those dishes rinsed and in the dishwasher. The kraft paper table covers are recyclable (yay!) and help keep your table from getting too messy. 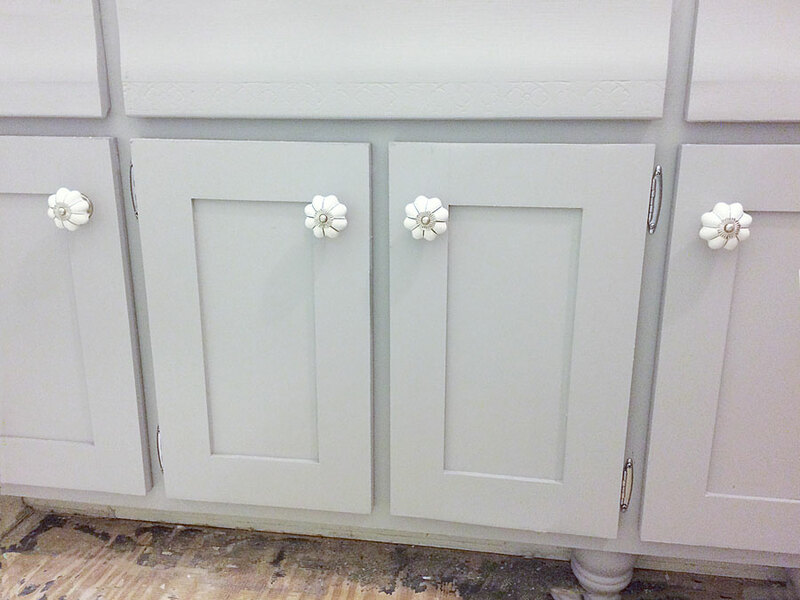 All that’s left is to pick up any trash lying around and wipe down the counters and tables. That’s it! Easy cleanup. 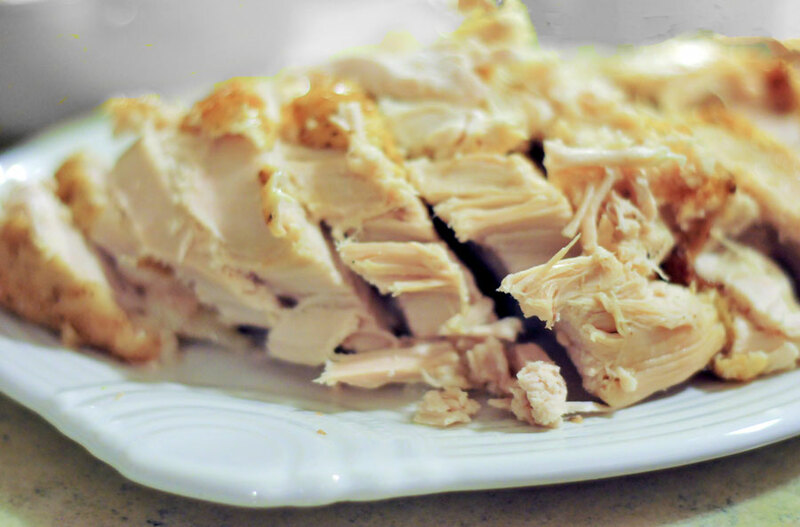 Need some ideas on what to do with all of those leftovers? Check out these recipes from Jessie at Life as a Strawberry. Happy hosting, friends!